David Attenborough has called for UK company Soco International to stop exploring for oil in one of Africa’s oldest national parks, days before a multi-award-winning documentary on the subject, executive produced by Leonardo DiCaprio, is released on Netflix. The legendary filmmaker and naturalist has raised urgent concerns over the threat to Virunga, a UNESCO World Heritage Site, home to some of the world’s last mountain gorillas. The Grain Media film. Virunga, charts the efforts of rangers led by Chief Warden Emanuel de Merode to protect the park and its gorillas from a number of threats including the advances of Soco, one of the UK’s 200 largest public companies. It will be released on Friday (7 November). Sir David Attenborough said: “Areas like Virunga were established as World Heritage Sites because they are sites of great scientific and natural value not only to the nations in which they are situated but to the whole world. The admirable principle is that these areas are to be protected not only for now, but for the future. To encroach upon them, to exploit them for temporary gain, to redraw their boundaries totally contradicts the ideals underpinning the protection of sites such as Virunga. 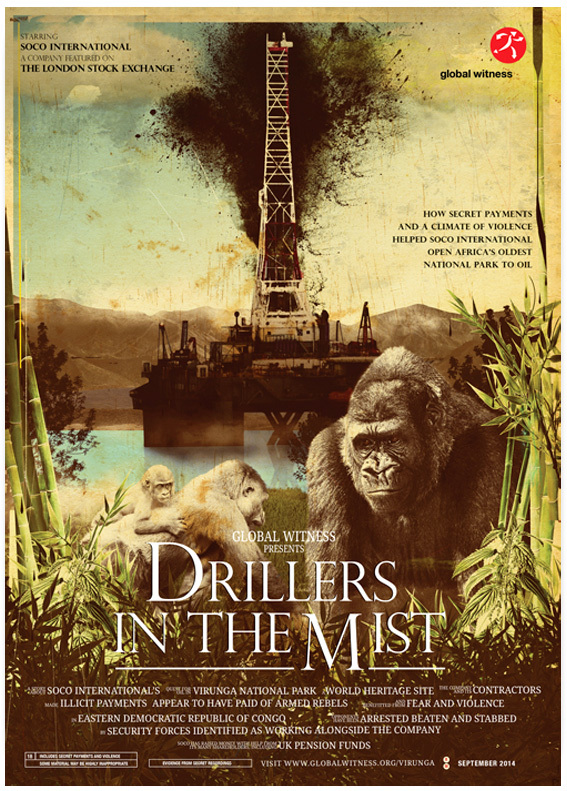 “I am deeply concerned by the matters raised by the film Virunga and the Global Witness report Drillers in the Mist. It would be extremely worrying if the great, rich and varied park of Virunga were to be exploited for oil. Not only would it threaten a park that is home to a vast range of wildlife including about a third of the world’s endangered mountain gorillas, but it would also send a worrying signal for the future of other world heritage sites. If the treasured Virunga park cannot be protected from drilling, can anywhere else? Virunga has more species of birds and mammals than any other African national park. Soco’s oil plans in the world heritage site have been opposed by many local community groups, Unesco and western governments. Sir David Attenborough is the latest high profile figure to speak out in defence of the park, joining Desmond Tutu and Richard Branson. As Virunga shows, park wardens face great dangers from threats including rebel groups, poachers, and illegal charcoal traders; 130 wardens have been killed since 1996. In April this year, de Merode himself was shot by unknown gunmen shortly after handing in a report on Soco’s activities to the regional public prosecutor. Congolese authorities are investigating the case, while Soco has condemned the attack and says “any suggestion linking Soco to this crime is completely unfounded”. Soco has yet to find oil in the park. Following sustained pressure from campaigners, it pledged on 11 June that, after completing seismic testing, it would not drill for oil within Virunga National Park unless Unesco and the DRC government agree that such activities are “not incompatible” with its World Heritage status. But Soco’s Deputy CEO Roger Cagle was reported on the same day in The Times saying that Congo and Unesco could agree to redraw Virunga’s boundaries – meaning the park could still be under threat. Pretty despicable but not surprising!